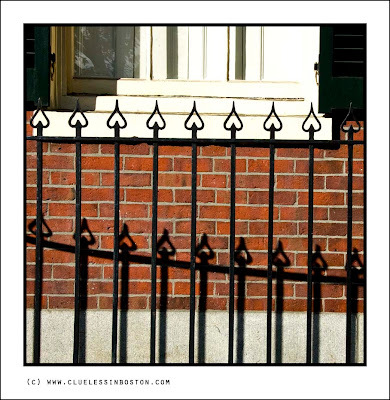 Autumn light duplicates an iron fence on the red brick of a Beacon Hill house. I agree with Malyss, wonderful light! Also I love those bricks! Amazing effect and what beautiful light! Lovely wrought iron reflections. Very pretty. Makes me think of Alice in Wonderland. Besides the main 'attraction', I like the stark white and the rich brick colors in the photo too. So well seen. Your blog is definitely one of my most favourites - you have such a consistently high standard of images. Those little upside down hearts are interesting. Neat composition in black, white and brick red.